A native Rhode Islander, Nick Ross first started turning heads at East Greenwich High School, having earned All-New England honors on the track and on the cross country course. Nick had a stellar collegiate career at La Salle University in Pennsylvania, which was cut short during his senior indoor track season due to a broken foot. 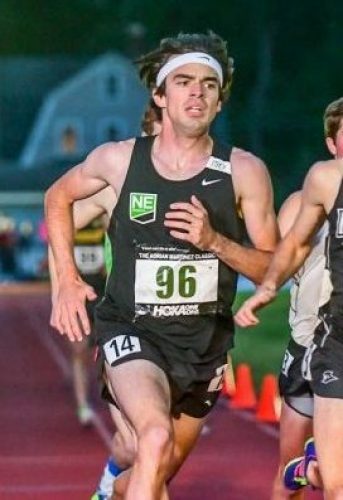 This left him hungry for more racing and, after graduation, Nick moved back to the Ocean State to join the NE Distance squad and focus on improving his mile speed. During his first indoor season, Nick came painstakingly close to breaking four minutes in the mile, running 4:00.18 and 4:00.64 at two separate invitational miles at Boston University. However, at the 2016 Adrian Martinez Classic, Nick finally broke through and ran a 3:59.73 outdoor mile, becoming just the fifth former Rhode Island Interscholastic League (RIIL) athlete to run a sub four-minute mile. He credited the move to NE Distance, and work with coaches Bob and Anne Rothenberg and Kurt Benninger, as the chief influences behind his success in breaking the four-minute barrier. While he assists in coaching Providence middle school cross country, Nick volunteers in coaching outdoor track at his alma mater of East Greenwich High School.